So I know it's been awhile since I posted about home security but there are just a few extra things we've learned from our break-in that I wanted to share. When the police asked for the serial numbers of our TV, laptop, and xbox, we had no clue! Even if they had recovered our stuff, they wouldn't have been able to verify that it was ours! That's why it's super important to write down the serial numbers of all your electronics and keep receipts from big purchases. Store your receipts and list of serial numbers in a fireproof safe (read below), give a copy to your parents (or another super trustworthy person) to keep in their files, create a file that you store on a backup hard drive, or upload them to a cloud storage site that you can log in to and access from any computer. Not only will the serial numbers help the police identify your stuff if it's found, but the insurance companies will want them in case of fire, theft, flood, etc. Get a fire safe. Fire safes are a great way to lock up valuables and keep them secure in the event of an emergency. Keep your social security card, birth certificate, important legal docs, and expensive jewelry in the safe and also scan them into the computer and store them on a cloud storage/backup site. Small fire safes are inexpensive and go for about $20 on Amazon . Thieves aren't stupid. They know to check your top drawer for valuables and look on top of the fridge for your money jar. That's why it's up to you to keep your stuff hidden. Yes, that means don't keep your spare key over the door, or under a rock! 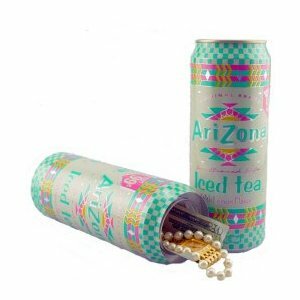 Get a fun stash box (love the Arizona Tea safe !) to camouflage jewelry and secret money stash, hide your fire safe in a completely out of site, and give your key to a best friend rather than leave it in some obvious place. The guys who robbed our apartment came in through the open gate in the back. It was winter and the locks were frozen so neither us nor the neighbors locked the gate. Major mistake. To keep locks from sticking in cold weather, squeeze a little WD-40 inside and they'll easily open and close. They also make weather-proof locks, though I found that they're not actually as weather-proof as they say so having the WD-40 on hand is a good idea. In the horrible event that someone breaks-in when you're home, have an emergency plan on hand. You should have a plan as to where to hide and which doors and windows are easily accessible. Yes, you may never use it but in the event something happens, you'll be darn glad you thought things out! Like I've said in previous safety posts, none of these tips are meant to scare you or make you paranoid. Just be smart about your stuff and don't do things that basically invite robbers to take advantage of you!